Parabens have been getting a lot of backlash lately. There is concern among public health advocates that the exposure to them over time may be contributing to a whole host of health conditions. That’s because parabens have been known to disrupt the inner workings of hormones in the body—a phenomenon that has been linked to breast cancer (among other things). Parabens can also mimic the natural hormone estrogen. Sulfates are also a popular product in the “no-no” department. They are used in almost as many items as parabens, as foaming and cleansing agents. The issue with sulfates is their ability to break down proteins, which can cause cell membranes to degenerate. They have also been shown to leave residue in the brain, heart and lungs. 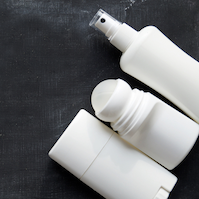 Aluminum compounds are a key ingredient in antiperspirants because they are able to plug sweat ducts and temporarily keep moisture from escaping. However, the constant application of this heavy metal is a growing concern as it can be absorbed through the pores of the skin (or even a cut). This long-term exposure has been rumored to be linked to an increased risk of breast cancer and Alzheimer’s disease. It has also been suggested that these compounds work as hormone disruptors like their paraben counterparts. Propylene glycol is a chemical that keeps substances from drying out (humectant) and was originally developed as an antifreeze product. Unfortunately, propylene glycol is categorized as a neurotoxin that has been known to cause kidney and liver damage as well as dermatitis. With all the risk associated with these any other ingredients found in antiperspirants, finding an alternative may be the safest course of action. Tell antiperspirants you’ll smell ‘em later. For information or to schedule an appointment with a miraDry specialist, contact the Hyperhidrosis Center at Thoracic Group today!